You may have heard of the new-ish social network (it’s actually more than that, but for most people the distinction isn’t particularly relevant) called App.Net, or ADN (for “app dot net”). I’ve been a member since August 2012, and I’ve been meaning to write about it for a while now. I think that ADN is important, and I’d like you to consider joining me there. $3 per month, if you pay yearly (i.e. $36 per year). $5 per month, if you pay monthly. Developer membership (with API key generation, etc), for $100 per year (about $8.33 per month). There’s also a free tier, but you must receive an invitation from a yearly-paying member in order to sign up for it, and there are some limitations on free accounts - primarily that you can only follow up to 40 others. If you’d like an invitation, keep reading. For Twitter users, ADN works just as you’d expect: you can follow people, and they can follow you. 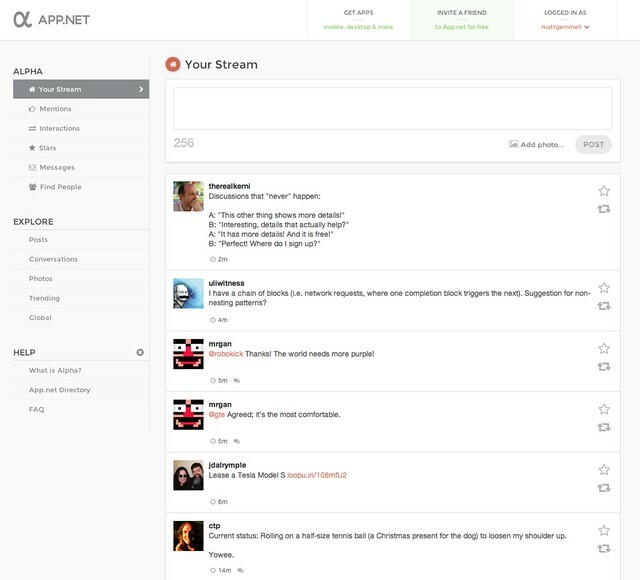 You can see your replies and mentions, the stream of posts from those you follow, and the global stream. You can send and receive direct messages if both the sender and recipient follow each other. There are even multi-user private chat rooms. You can repost and “star” others’ posts. You can include usernames, hashtags, links and photos in your posts (and ADN themselves will host your media files, subject to file-size and storage limitations; you can even manage those files online). You can even natively “mute” users you don’t want to hear from at the moment, but don’t wish to actually unfollow. You get 256 characters per message instead of 140, for your extended edition thoughts. Each post has a permalink which is visible on the web, with its surrounding conversation, even if you’ve not signed up to the service yourself. So far, so familiar. The interesting part, though, is what you won’t be used to from Twitter. There are no ads, anywhere. Because it’s a paid service, there’s no spam at all; I’ve certainly never seen any. There’s an active and happy developer community, which ADN actually financially rewards. There’s a rich, modern, relentlessly improved API. And again because it’s a paid service, there’s a commensurately (and vanishingly) low number of Bieber fans, teenagers, illiterates, and sociopaths. But the real difference I notice is in the conversations. On Twitter, the back-and-forth tends to be relatively brief, not only in terms of the 140-character limit, but also the number of replies. There’s a certain fire-and-forget sensibility to Twitter; it’s a noticeboard rather than a chatroom. Then there’s the keyword-spam (woe betide the person who mentions iPads, or MacBooks, or broadband, or just about anything). Oh, and let’s not forget the fact that any malcontent with internet access can create an account (or two, or ten) in seconds. Not a happy mixture. That’s the paradox of Twitter, for me. The company has decided that it’s another advertising platform where its users (and their contributed tweets) are the products being sold; just like Facebook. Your participation is a means to an end: getting ads in front of eyeballs. The mission that Twitter has in mind for you is to see “promoted tweets” from other companies who purchase advertising. You’re meant to be reading, rather than writing. However, given the endemic and burgeoning spam and trolling problems that find fertile breeding grounds on a service that (1) is free to join, and (2) has no directly business-aligned interest in preventing such antisocial behaviour, anyone with more than a certain number of followers is actually motivated to use Twitter more as a write-only forum. Followbacks have long since ceased to be the norm, and any account that practises unqualified reciprocal following is all the more likely to be a one-way broadcast outlet. Mutual following is also a risky business on a spam-saturated service, because of the direct-message system. So, Twitter wants us to read, but isn’t interested in (and indeed, cannot be interested in) curating the content. We, as social creatures, however, want to connect and participate, but any such participation is doomed to decrease as our exposure to the unfettered masses rises correspondingly. It’s a bit different on ADN, primarily due to a certain proprietorial air. Its users are paying customers, after all, who have stumped up their money for the service itself. They don’t need to be otherwise ‘monetised’, and indeed would doubtless vote with their wallets and go elsewhere if they felt that their position was being unreasonably taken advantage of. Such is the relative power and privilege of the consumer - particularly when the product in question is actually a subscription service, with a major and nominally “free” competitor. ADN simply can’t afford to sell you, whereas Twitter must do so. In almost all cases, they’ve paid to use ADN. In the remaining cases, they’ve been invited by someone in the former category. There’s a sense of proprietorship, rightly or wrongly, and a presumed overt interest in the continuation of the service itself. All of these factors psychologically pull towards the same perception: that of exclusivity (or perhaps “elitism” with a very lowercase “e”, for the staggeringly elite cost of three dollars per month). Then, add in the fact that you have almost twice as much room to express yourself in each post, and you end up with a very different beast from Twitter. The practical effect, which I notice daily, seems to be that people are more willing to participate in conversations, and also more careful about how they express themselves. Such a broad generalisation has no hope of being true for everyone, but it’s been my consistent perception during the months I’ve been using the service. Whilst I have fewer followers on ADN than on Twitter by a factor of five, I feel less pressure to post regularly, and more able to dive deeply into the occasional conversation (sometimes as a contributor, and more often as a spectator). As a developer, I appreciate the rapid, open and forward-thinking improvements to the API (and clients thereof). As a customer, I appreciate the visibility and responsiveness of those who run the service (if you do have an issue, the buck stops at Dalton). But above all, I’m a user, and as a user I appreciate the most intangible and elusive of things: the atmosphere of the place. It’s clear that smaller communities have a certain closeness due to their size, and that it’ll inevitably decrease as the service expands, since there will be fewer overlaps amongst the various social sub-graphs. It’s equally clear that a paid service is a significant deterrent to spam (the economics just don’t work when your sock-puppet accounts cost you a handful of dollars each), and furthermore it’s the admittedly uncomfortable truth that any community which requires a credit-card to enter will probably have cleaner, safer, better-lit streets. There’s no great revelation there. But then we come back to these wooly words like “quality” and “atmosphere”. ADN will inevitably become larger, and thus by definition less exclusive. Perhaps its cost will even decrease, as it already has done (when I signed up, the yearly fee was fifty dollars rather than thirty-six). However, by all accounts it will remain a paid service, and therein lies the nub of it. We value what we pay for. We not only pay for things which we deem to be of value, but we also retrospectively assign and justify value based on what we’ve paid. Any consumer is familiar with the simple psychology of cost equating as much to value after the transaction as value does to cost beforehand (likely moreso, from my own experience). At its core, I don’t think that the reason for the noticeably different, warmer, more discursive “feel” of ADN is any more complicated than that. It’s the macroscopic, aggregrate result of it that matters, though. People who are invested in something want to preserve it. A touch of judicious forethought here, and an additional few words of clarification there. A stance that errs slightly closer to participation, and slightly further away from shouting into the ether. Closing a shared door when leaving, and being careful not to slam it when the hour is late. It’s the same thing. Maybe it’s the self-interested civilising effect of club membership, and maybe it’s just “not in my back yard”, but I think the reason is probably unimportant compared to the effect. I find myself more willing to write both throwaway and more personal things. I feel that ADN is more conducive to long-form, sustained discussion, and garners more considered responses. And the service itself, in my peripheral vision, is more of a valet than Twitter’s increasingly sinister overseer. I feel at ease to discover what the service means to me, in my own time. A minor change - paying for it - has a profound impact on the experience. With all that said, I’d like to put my money (almost literally, I suppose) where my mouth is, and invite you to try ADN for yourself - at no cost to you. If you’d like to try App.Net before you decide to pay for it, you’re in luck - maybe. The company has offered me a few hundred invitations to share with my readers, and if you’re quick, you can get one. I’ve previously taken the stance that invitations to new social services should only be given out to people that you’d want to follow, and I don’t think that’s an unreasonable position. It’s particularly important when the number of invitations available is limited (ADN usually gives you about 5 at a time, I think, which are renewed as necessary), but the point stands regardless. Having said that, the lifeblood of any social service (and certainly a for-pay one) is of course its users, and the network effect is very real. I’m not sure where the right balance lies between ADN’s current small-community, discussion-focused feel, and building a larger platform by increasing participation. It seems reasonable, though, that more users is probably better, at least for the present and the near future - particularly those users who choose to actually pay for the service. As I’ve thought more about ADN and the way that I feel quite differently about it than I do about Twitter, I’ve come around to think it’s perhaps OK to cast a wider net. Note that if you sign up with my invitation link, you’ll automatically follow me on ADN, presumably saving you an inevitable click shortly thereafter (you can naturally unfollow me at any time). Also, keep in mind that free accounts impose a limit of following at most 40 others, but you can easily upgrade to a monthly or yearly paid account if you decide to. ADN has its own resource page for finding people to follow, and there are many people-discovery tools available. I’ve used Friendfind.co and ADN Friends to quickly find the ADN accounts of the people I follow on Twitter. Here’s the list of people I’m following on ADN at the moment. There’s a large and ever-growing directory of ADN apps, sites and services, including mobile apps for iPhone, iPad, Android, Windows Phone and Symbian, desktop apps for Mac, Windows and Linux, and assorted services and browser-extensions. Do take the time to have a look through them. I’ve listed the specific ones I use below, and a few others. The web interface to ADN is called Alpha, and you can find it here. It works just as you’d expect, with the features you’re used to from Twitter. If (like me) you’re a great big vanity-pants and want to track who stars/favourites and reposts your stuff (like favstar does for Twitter), you can do so on on Reposted.me. There are many third-party web ADN clients, and also browser extensions for Safari, Firefox and Chrome. I use Kiwi for Mac. 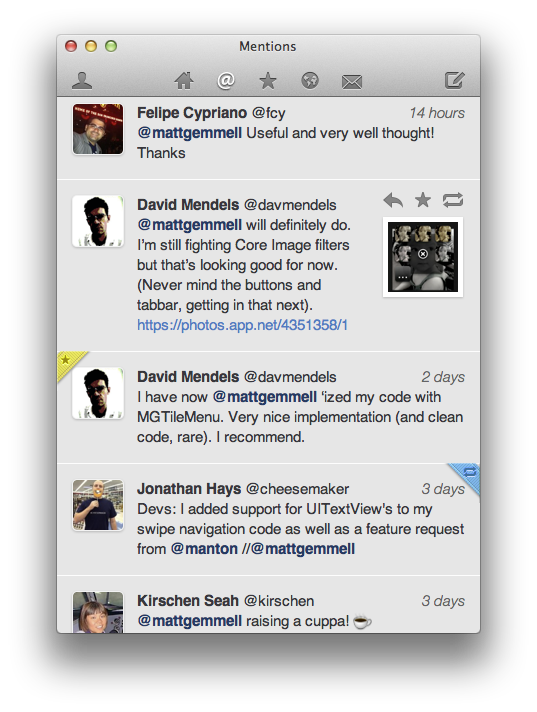 It’s modern, regularly updated, and stands shoulder to shoulder with my chosen Mac Twitter client, Tweetbot. Its developer is Isaiah Carew (isaiah on ADN). It also allows me to drag images directly into the message-composition window (as Tweetbot does for Twitter), which I’ve always liked, and it can even cross-post to Twitter selectively if you so desire. You can read an interview with Isaiah about Kiwi too. If you’d prefer another Mac ADN client, there are plenty to choose from. I use Felix for iPhone by tigerbears. It’s elegant, attractive, has excellent VoiceOver accessibility support, and is constantly being improved and updated. Its creator is Bill Kunz (billkunz on ADN). 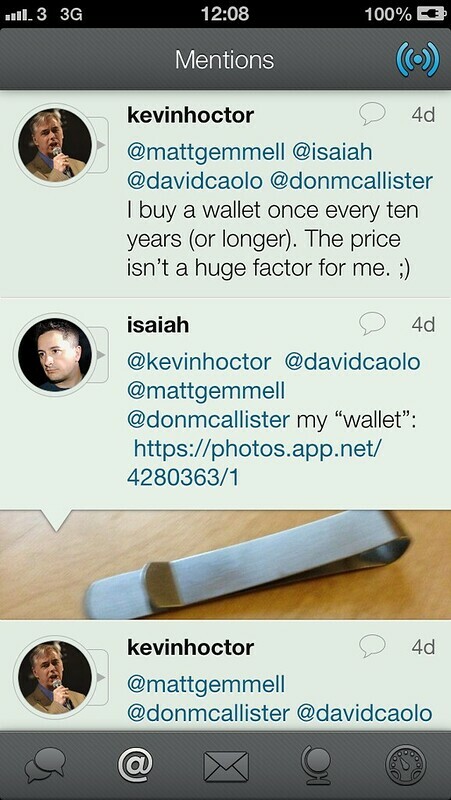 You might also want to try Riposte, hAppy and Netbot (which is the ADN version of the much-beloved Tweetbot). Indeed, there’s an iPhone ADN client for every taste. 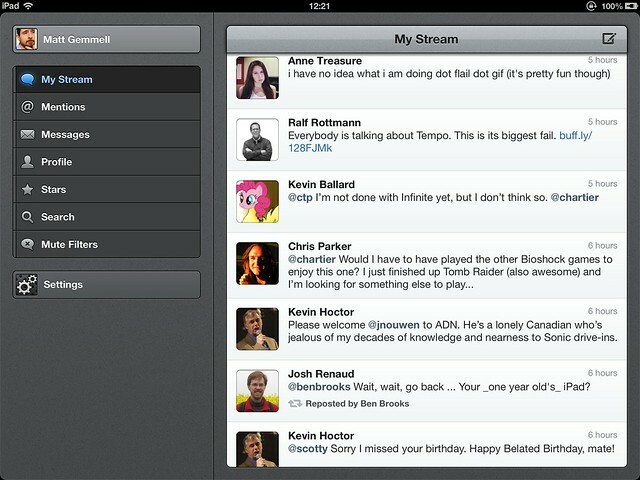 I use Netbot on the iPad (by Tapbots), and I’m keeping a keen eye on developments with my favourite iPhone clients too. You may also wish to try one of these iPad ADN clients instead. I don’t personally use these operating systems often enough to have a chosen ADN client, but you can find ADN clients for Windows (desktop) and Windows Phone, with more being added every week. Our cousins on Android are most welcome on ADN. Symbian devices aren’t left out of the fun, and you can even find an ADN client for the Linux command-line, if that’s your sort of thing. Mozilla’s QA engineer for accessibility, Marco Zehe has written a guest article on accessible ADN clients. I work with accessibility technologies on iOS and OS X regularly, and ADN users are extremely well served in that capacity, as Marco notes. Twitter isn’t going away, but for a certain type of user, it is going downhill. I’m in a very privileged position on Twitter, and I don’t just mean because a number of people have kindly decided to follow me; rather, it’s because I have the benefit of socialising largely with developers, designers, and other professional creative people. If there are leafy suburbs in a social network, then surely I reside in one - but the inner-city slums are sadly encroaching by the month. I’ve long said that I’d like to pay for Twitter access, even just to get rid of ads and to have the ability to meaningfully support third-party clients with a guarantee of being able to remain financially viable. To pay the rent, if you like. But the company has refused to allow that option, and thus the street party is increasingly fringed by gangs. Trends and hashtags are graffiti more than they are useful data, and the sense of exposure (and my corresponding instinct towards taciturnity) is higher than ever. It’s sad; truly. It’s also not the only option. The developers that I count as colleagues and friends are well aware of a problem called the “race to the bottom”; it’s the trend in app pricing to sell software for a pittance like 99 cents, or even to make it free and just hope to find sustainability later or elsewhere. It’s a corrosive practice, that devalues not only our effort, but also our output. We’re worth more, and so are our apps. Yet for some reason, many of us don’t realise that the same applies to services. Your free feed reader can go away, as Google Reader is about to. Your free email service has ads down the side, and is perpetually in a precarious position. Your free search engine has to track you, and sell your data. Your free social service puts you on the store shelf, and sells you to each advertiser who comes bidding. You have no right to complain, as long as your legal rights haven’t been violated. Because it didn’t cost you anything. And similarly, the service provider has little reason to care about your feelings, because you’re not a revenue source. The solution - or at least the beginning of one - is simple enough: pay for it. Own your data, and your services, and your apps by being the customer. You not only gain power and control, but you also directly contribute to the longevity of the thing you enjoy. A payment is a vote, and is also a right to vote. If you have non-trivial feelings of annoyance when you find out that you’re the product being sold, then do something non-trivial about it, and take control of this small piece of your destiny. The service providers (and app makers) surely deserve it, but you deserve it more. Twitter will not let you pay, because they’d lose the right to rent your eyeballs and brain out to the companies who do pay. That’s just the nature of their business model, and no-one is under any illusions about it. ADN, by contrast, is a place where you can be the customer. I find that prospect alone very attractive indeed. When I get up on stage and tell people that they deserve to be paid for their work, that’s what I’m talking about. It’s an inseparable corollary of that to say that you deserve to pay - because of the control and privilege it gives you. The ADN ecosystem is stunningly rich and healthy for such a young service, and its environment for the user is more akin to an artisanal coffee house or a book club than Twitter’s increasingly-contaminated noisy bus-station or juvenile detention centre. It’s just a nicer place to be, because people have chosen to be there. If, as I do, you remember the heady days of Twitter a few years ago, and see all too clearly where things started to go wrong, perhaps you might at least consider putting aside any preconceptions and hedging your social bets. I’m not quitting Twitter by any means, but I’m delighted that a service exists which allows me to pay (having all the privileges and comforts which that entails), and which seems designed to remain true to the original ideal of Twitter rather than the tarnished reality. Once again, you can get your free ADN invitation here. I look forward to seeing you, and I look forward to your decision to pay for the service when you’re ready. I’m mattgemmell on App.Net (and also @mattgemmell on Twitter). You should follow me.